In Sherman’s 1864 Trail of Battle to Atlanta the author traces the principal routes of march and sites of battle used by the Confederate and Union armies in the 120-day Atlanta Campaign. 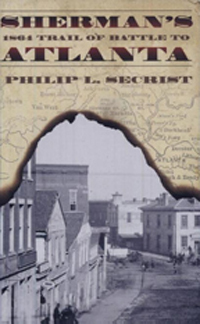 Special care is given to locating and identifying local families living along this path of war in 1864, and through their letters, diaries, or books, shares their experiences of war. Frances Howard’s book In and Out of the Lines, chronicles the hardships experienced by families in the path of marching armies, and in Lizzie Grimes’s diary she describes the burning of her house and town of Cassville, Georgia. Through historic and modern topographical and highway maps and photographs, roads and houses along the march are located, and their present state of preservation or use is noted. Exact location of events along the way have been identified through the recovery of military artifacts on the site and through comparing terrain features described in official reports by battle commanders with the existing character of the site today. Other skirmishes or battle sites were located from recorded information on Sherman’s official maps. The work is particularly valuable in its connection between the archival record and the physical location to which that record refers. The commander’s decision to “stay and fight” or extract himself from a difficult situation by “maneuver” is often substantially influenced by the terrain upon which he finds himself and the advantage enjoyed by the enemy. By drawing these points of data together, Sherman’s 1864 Trail of Battle to Atlanta brings the beginning of the infamous march to life.